Kansas players huddle around Kansas center Udoka Azubuike (35) before a one-and-one during the second half at Lloyd Noble Center on Tuesday, Jan. 23, 2018 in Norman, Oklahoma. Anguiano said the name of the intended recipient of the man’s advice was not relayed to him by the officer on scene. 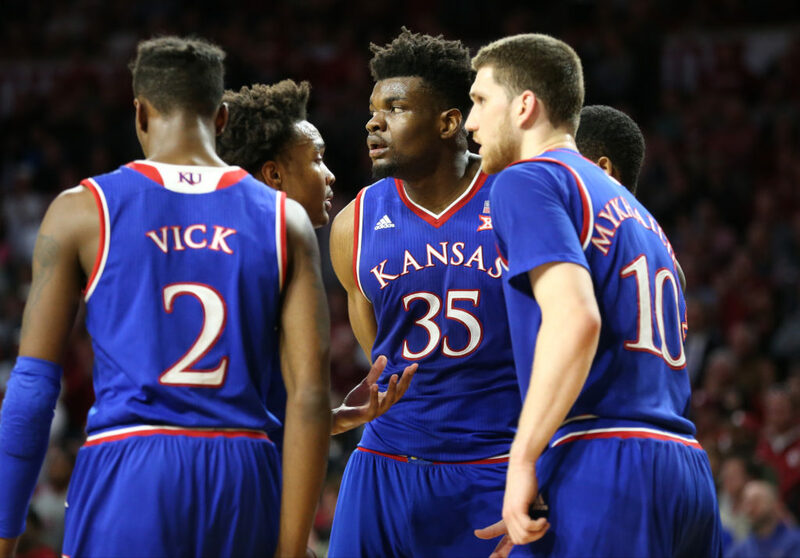 In the final 3:37 of the KU’s 85-80 loss to Oklahoma Tuesday night in Norman, Oklahoma decided to repeatedly foul Udoka Azubuike, sophomore center from Nigeria, in hopes he’d miss his free throws. And the strategy played out just like Oklahoma wanted. Azubuike — shooting an abnormally low .375 from the free-throw line — went 1 for 8 in free-throw shooting for the game. In the final 3:37 he went 0 for 6. — Journal-World and kusports.com staff contributed to this report. KU coach Bill Self joked about the incident while meeting with the media Thursday.